A waterless solution to beautiful hair. The recent Cape Town water crisis had us all shaken and even though the dreaded ‘Day Zero’ is now behind us we all still need to do our bit to save water wherever we can. There’s no doubt that a woman’s daily beauty routine uses a lot of water, especially if it’s a hair wash day! Luckily for beauties across South Africa there’s no need to choose between having beautifully clean hair and the environment. 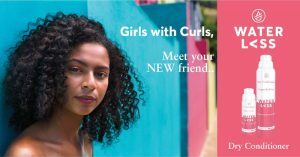 Waterl<ss, a range of hair care products co-designed by women in Cape Town during the water crisis makes it oh-so-easy to get beautiful looking locks without water. Designed to be used exclusively on dry hair, Waterless offers a collection of products, suited for different hair types, that can be used to refresh hair in between washes. But this isn’t just another dry shampoo, Waterless has been designed to not only absorb oils at the roots but also to extend the look and feel of soft, clean hair without the need to shampoo in the shower. The brainchild of P&G Beauty, the products were designed with the mission to return 50 billion litres of water to the Greater Cape Town region. 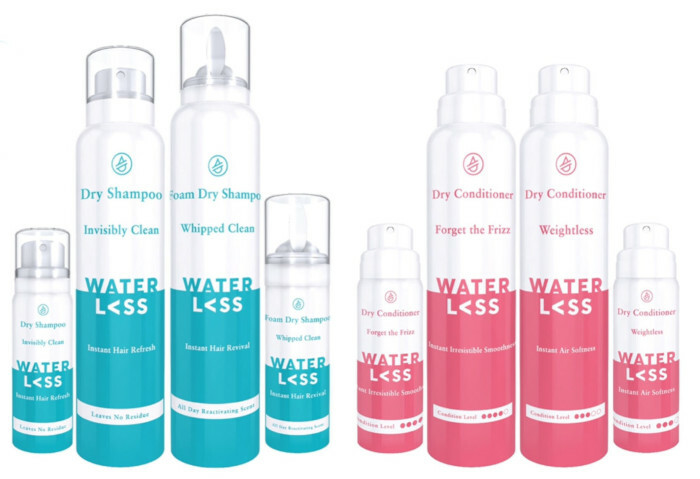 There are four products in the Waterless range — two dry shampoos, two dry conditioners, and a hair refresher. Suited for all hair types, the Waterless Foam Dry Shampoo (R149.99) is lightweight and instantly revives hair. It features breakthrough fragrance technology with a long-lasting reactivating scent. The ultra-lightweight Instant Refresh Dry Shampoo (R149.99) is ideal for fine to normal hair and leaves hair looking and feeling clean and refreshed with a fast absorbing, oil removing powder that leaves no residue. Curly haired lasses will adore the Waterless Dry Conditioners, which works to control water loss and leave hair feeling soft and smooth. It’s so easy to use, simply shake and spray! 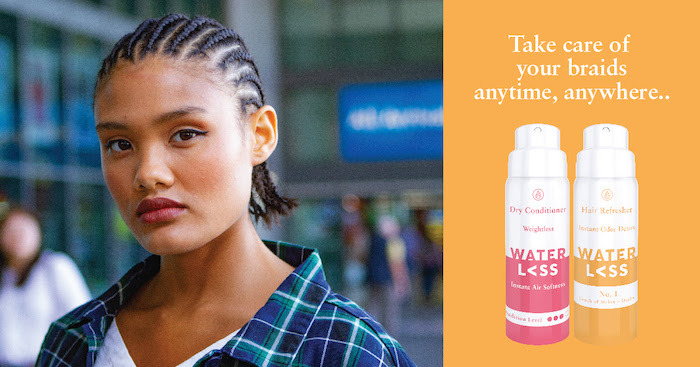 Specially formulated for dry and curly hair, the Waterless Forget Frizz Dry Conditioner (R149.99) instantly softens your hair leaving it feeling fresh and hydrated. The Weightless Dry Conditioner offers a conditioning solution for all hair types, without the weight. The Waterless Hair Refresher (R69,99) is a totally unique product — available in three delicious scents, this spray is a hair perfume with added benefits. It’s alcohol-free so it won’t dry out your hair and instantly transforms unpleasant smells like sweat, food or tobacco into freshness. Just like the dry shampoo, the spray has long-lasting, reactivating properties, so every time you run your fingers through your hair you’ll get a burst of fragrance. It also goes beyond the call of duty by controlling frizz and getting rid of static in your hair. Find it in Touch of Melon & Herbs, Sweet Apple & Luscious Berry, and Black Current & Pineapple. The Waterless range is available at selected Clicks store as well as online through Clicks. Fit it at Clicks V&A Waterfront, Canal Walk, Cavendish Square, Gardens Centre, Stellenbosch, Tyger Valley, Blue Route, Somerset Mall, Gateway, and Sandton City. Want more beauty finds and reviews? Check out our Beauty section for more exciting reading!